If you're into Halloween and all things that go bump in the night, there’s no better vacation than a spooky sleepover at a haunted hotel, inn, or vacation rental. If you’re a fan of history, most of these places also include small museums or libraries that contain old newspaper clippings and information ​about what makes them haunted. From the Crescent Hotel in Eureka Springs, Arkansas to the Shamrock House in Rocky Bottom, South Carolina, the following nine places offer overnight accommodations for those who are fans of the supernatural and suspense. Explore this list and plan your next spooky vacation. 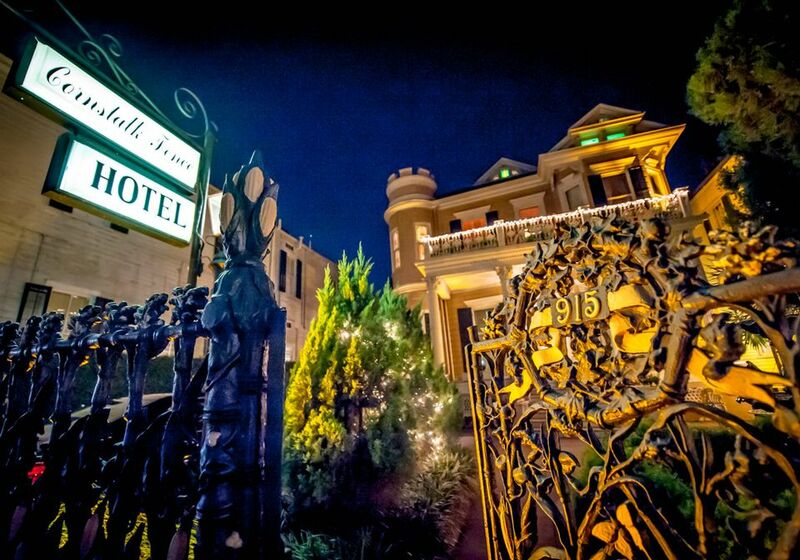 Perched high above Eureka Springs, the 1886 Crescent Hotel is an Arkansas landmark that revels in its haunted pedigree, boasting itself as “America’s Most Haunted Hotel” and offering vacation packages for thrill-seeking tourists. In the 1930s, the building was a sham hospital where a charlatan named Norman Baker conned patients with his "miracle" cure for cancer. Said to be haunted by former patients, the hotel now hosts nightly ghost tours and paranormal-themed performances in the on-site theater, and you can even tour Baker's morgue! The hotel also keeps a list of all of its named ghosts, including Michael, an Irish stonemason who died in 1885 while constructing the building; Theodora, a cancer patient of Dr. Baker who calls out for help finding her keys; and even Morris the cat, a mysterious patient in a white nightgown who appears at the foot of your bed. Known for its grand architecture, magnificent setting, and renowned visitors, the Stanley Hotel is also famous for its role as a setting in Stephen King's novel, “The Shining.” Nearly every guestroom is said to be haunted, and guests report hearing children laughing and a piano playing, or having their bags mysteriously unpacked for them. A staple on haunted hotel lists, this Colorado hotel offers a ghost adventure package and three different Halloween tours. Special events during the haunted holiday include a murder mystery dinner, the Shining Ball, and a masquerade costume party. On Royal Street in New Orleans' beautiful French Quarter, the Cornstalk Hotel is a standout for its famous cornstalk-motif wrought-iron fence and castle-like turret. Built in the early 19th century by François Xavier Martin, the first Attorney General of Louisiana, the hotel has a reputation today for being haunted by apparitions of children at play. Also, some guests have reported a strange and creepy phenomenon: their cameras mysteriously contain photos of themselves asleep in their hotel guest room. New Orleans is an excellent city for other haunted adventures, featuring some of the most beautifully maintained and oldest gothic-style cemeteries in the United States as well as a number of other locations known to host ghostly visitors. In a town infamous for its 17th century witch trials, Room 17 at the Salem Inn is said to be haunted by a woman named Elizabeth, who was murdered by her husband in that very room. According to accounts from psychics and guests, Elizabeth particularly likes to shake things up when men stay in the room. Legend has it that if you leave a glass of liquor for Elizabeth, she’ll leave you alone. Bring an extra sweater; the innkeeper reports that room 17 is always colder than other rooms, despite the innkeepers' efforts to turn up the heat. In Savannah, billed as the most haunted city in America, the ghostly backstory at the Foley House Inn can be traced back to the original owner, Honoria Foley. Legend has it that when a suspicious hotel guest attacked Miss Foley, she struck him over the head with a candlestick and killed him, but fearful that she would be imprisoned for murder, Ms. Foley hid the body. On her deathbed, Miss Foley confided about the murder but never revealed the location of the body, and during a renovation in 1987, human remains were indeed found in the wall. The murdered attacker and Miss Foley have both been seen as apparitions in this haunted hotel, so if you plan to stay in one of the 19 rooms available at this quaint bed and breakfast, don’t be surprised if you wake to a shadowy image of Miss Foley crying in the corner of your room. On a gorgeous stretch of sugary sand in St. Petersburg lies an iconic pink palace. Built in 1928 by Thomas Rowe, the hotel quickly became a playground for the rich and famous and remains so to this day. However, the hotel itself has a frightening backstory. A heartbroken Rowe built the hotel as a tribute to his true love, Lucinda, who died in Europe. It thrived through much of the early 20th century, even making it through the Great Depression, but it fell into disrepair after Rowe was found dead in his hotel room in 1940. Originally built as a girls' finishing school following the Gold Rush, the Queen Anne Hotel is said to be inhabited by the school's late headmistress; dozens of guest accounts speak of Miss Lake appearing in mirrors or being felt as hot or cold spots. There's even a report of Mary snugly tucking in a napping traveler with the blanket all the way around the bed. While the innkeeper has never personally seen the ghost, guests report encountering spirits at least a couple of times a week. Situated between two cemeteries, Captain Grant's is on the National Register of Historic Places and is said to be frequented by no fewer than 10 ghosts, including a 5-year-old girl named Deborah Adams. The lingering spirits are children that are believed to visit from their resting places nearby. Named partially after the year the original building was constructed, Captain Grant’s, 1754 first served as a home to Captain Grant’s family and their offspring (for three generations) before passing on to serve as a bed and breakfast that sheltered both Civil War soldiers and escaped slaves. As a result, guests have since reported seeing ghosts from every time period in American history. Bring the whole clan and a big sense of adventure to this family compound in the Blue Ridge Mountains that’s available as a vacation rental. Originally constructed in 1925, Shamrock House sleeps up to 24 people in eight bedrooms and is said to come with a ghost named Nancy. One guest claims to have seen a woman walking into an upstairs bedroom while another says the name Nancy was whispered in her ear. Stay in this South Carolina haunted house and solve the mystery of Nancy the Ghost. LakeLubbers offers vacation rentals 2,000+ lakes in the US & in 80 other countries. What Exactly is a White Pumpkin?